For ten years I worked on the 24th floor of the Oakbrook Terrace Tower in Oakbrook Terrace, IL. Recently I came across the image above showing the view from my desk. It was a unique building. Firstly, it’s the tallest building in Illinois outside Chicago (31 stories). Secondly, we had a completely unobstructed view from very vantage point on our floor. For a few years our office space took up the entire floor. The next tallest building in the area is a condo in Oak Brook at 16 stories. To the east was Chicago and its world-class skyline and all other directions featured the vast expanse of Chicago’s suburbs. We could never exactly figure out just how far we could see. It was like being in the middle of the giant toy train set. We were just high enough in the air to see into the far beyond while being low enough to see activity on ground level. Also, pending thunderstorms were easily identified by the moving mass of gray. Coupled with the view was the red-tailed hawk that nested a few floors above us. Every so often we’d see the hawk shoot like a rocket in a straight line into a tree and snag lunch. ade like some of his east coast skyscrapers. Like several other Jahn buildings, even the sidewalks were designed by him. The tower is octagonal with four chevron gables at the top and chevron arches over the 2 main entrances. Each of the top 4 floors has 16 corner offices. Tallest building in Illinois outside Chicago. The five-story lobby is clad in white Statuario Venato and gray Moncervetto marbles. It features a stainless steel sculpture by Nancy Graves titled Peripeteia ’88. After its completion, opponents of the tower spread a false rumor that it was leaning. The rumor made it into the Chicago Tribune before it was discredited. The glass spandrels are patterned with a silvery sheen which gives them the appearance of aluminum. The design features chevrons not only in the gables and entrances, but in the lobby walls, elevator doors, and the tiles of the health club’s swimming pool. The main entrance is aligned with a long tree-lined driveway coming off of Spring Road from the east. 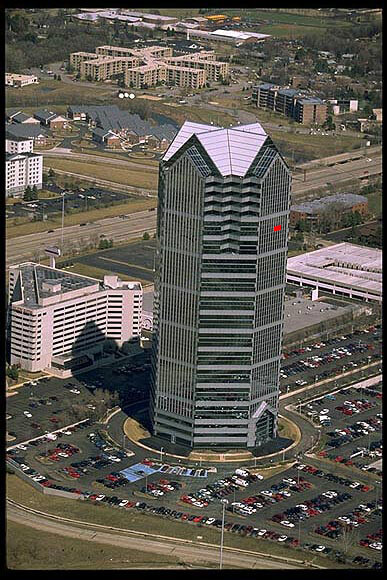 Oakbrook Terrace Tower, an octagonal 31-story office building, was designed by Helmut Jahn and built in 1987. It is the tallest building in Illinois outside the city limits of Chicago and is currently owned by General Electric. The 418-foot (127 m) tower has 773,000 square feet (71,800 m2) of office space. It stands on the site of the former Dispensa’s Castle of Toys.